With all of the different courses, training equipment, and gear needed for golf, it’s sometimes hard to really know if you are truly doing the right thing. Without having an instructor there with you, how do you know when your grip is wrong? Here’s a great new golf glove from SensoGlove that tries to make that problem a little easier to diagnose for the average golfer. On the outside, it looks like your standard golf glove, however it features a LCD screen on the top flap. There is actually a computer inside the glove that is fed by sensors all over the glove and finger tips. Those sensors measure your grip on the club, and whether your grip is tight enough or not. The LDC screen gives you a visual readout of which fingers need to be tightened or loosened. 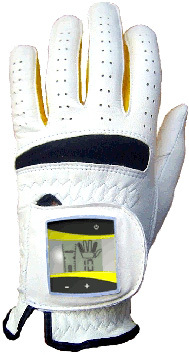 Also, the glove plays audio to let you know to look at the screen and find out why your golf grip isn’t correct. This glove will cost around $119 and comes in both mens and womens sizes. When you need a replacement, you can take out the computer and move it to a replacement set of gloves for only $26. Check out more details on the SensoGlove website. We are introducing our self as specialized Manufacturers and exporters of embroidery golf gloves, riding gloves, grip gloves, cycle gloves, fitness gloves, driving gloves,Summer gloves, winter glove, motorcross gloves motorbike gloves working gloves .The products of our company fully guaranteed and reliable.We are able to supplying you in time delivery with competitive Prices. Management is stand by to giving you fully business related information as soon as possible. Hope to serve you with our products in future.Please see the attachment. Very nice site! I live in Tokyo & sometimes see Electric Golf Cart exhibits & always enjoy looking at the beautiful creations! Electric Golf Cart can be a very rewarding and relaxing way to ride around in. I like the Electric Golf Cart pictures and good info. keep it up. This is Agha Bro Intl from Sialkot in Pakistan. We are seeking an opportunity to establish trade relation with you and your company. We have been manufacturer and exporter of All Sorted Gloves like as Golf Glove,Fitness glove,Cycle glove,Motorbike Glove,Driving Glove,fashion Gloves, Driving Gloves….etc and parts for 12 year and we have many connections all over the world. Our quality products are recognized due to superb quality and reasonable prices in international market. Kindly give us a order so that we may show you our worth in field of quality and service. We are sure that our first supply will please you and your clients too and will find us far better than other suppliers in all respects. Shall be awaiting your reply and will have our best attention. Your weblog article is very intersting and fanstic,at the same time the webpage topic is distinctive and perfect,excellent work.To your good results. With this weblog submit you have guide me to discover the facts which I need to get far more details. Many thanks for that! this web site is really nice and the users are actually sharing good thoughts.